Errol: Good grief! It’s the 28th already! Not… that I’m trying to get anyone to panic. Wow, this November has been crazy. And I haven’t done my bills yet either! Not that you want to know that. Anyway, I know you guys are doing great, so stay on target! 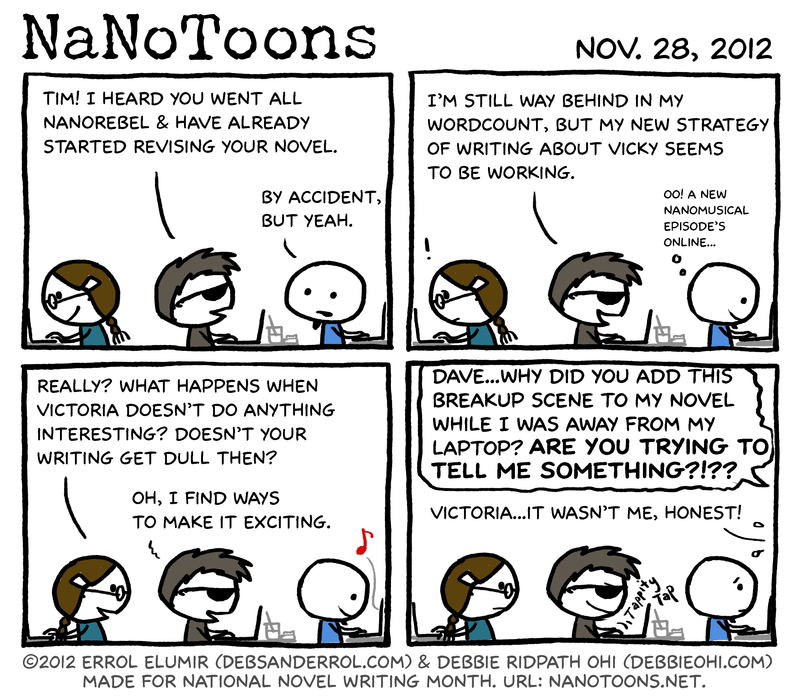 And for those that have time in between your writing, here’s the latest episode of Nanowrimo: The Musical! Debbie: Thanks for everyone’s comments about NaNoToons. I may login later than Errol every day (or rather, he stays up way later than I do every night :-)), so I don’t to add my comments until the morning. Anyway, I’ve been enjoying following the conversations, and I’m rooting for you all & your NaNoNovels. And on a side note: YAAAAAY, another NaNoMusical episode!! !